If you thought there was nothing left for the Clinton propaganda machine to blame Russia for during this election season, hold on tight! Newsweek’s infamous Kurt Eichenwald just released another bombshell: the US is being hacked by a massive army of elderly Russian emigrants who, underneath those headscarves, are actually top-notch cyberspies! Newsweek has finally cracked the case! Western intelligence and law enforcement say tens of thousands of people have been working with Russia on its hacking and disinformation campaign for many years. They include propagandists and cyberoperatives stationed in Moscow, St. Petersburg and Novosibirsk, located in the southwestern part of Siberia. Operations have also been conducted in the United States, primarily out of New York City, Washington, D.C., and Miami. Those involved include a large number of Russian émigrés, as well as Americans and other foreign nationals. Intelligence operations in Europe and the U.S. have determined that the money these émigrés receive for their work is disguised as payments from a Russian pension system. Evidence? Nah — who needs it? You read that right: thousands of Russian retirees that moved to the States to live with their kids are hardly who they pretend to be. Those babushkas and dedushkas are really soldiers (or maybe even officers!) in the army of cyberspies hacking America from within for Donald Trump, according to Newsweek. Why Trump? Because he’s Putin’s puppet, of course! Eichenwald goes on to reiterate his earlier theory, which, according to his own admission, was fed to him by US intelligence. He claims that the Republican nominee rehashed Russian “propaganda” at a rally speech — transmitted to the candidate by none other than yours truly, Sputnik News. What Eichenwald misses entirely is the irony of admitting that he was handed the story by his own government — the very definition of propaganda. “You need to ask yourself — how does someone like me who is deeply wired into the intelligence community know so fast that you had posted this? It’s not like I was sitting around reading Sputnik. Others are though, and they are not reading it 24-hours a day in real time for the purpose of keeping abreast of the news,” Eichenwald told former Sputnik News writer and editor Bill Moran in an email. Not to mention that Eichenwald tried to bribe Moran with a job as a political reporter for The New Republic in exchange for his silence, when his lies and attempts at a cover-up were revealed — he also left that out of the new report. 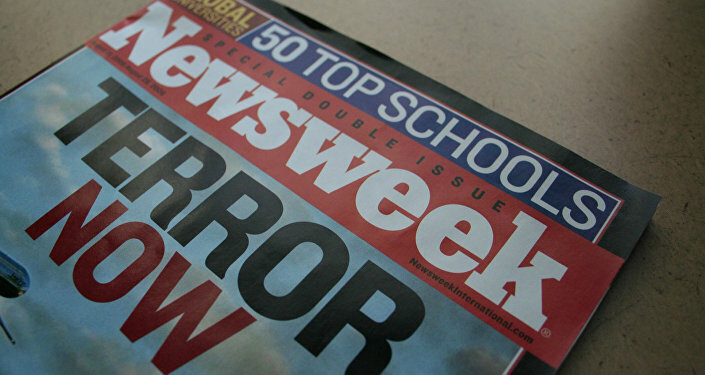 Newsweek’s darling also failed to mention that, since his original story was published, it has been widely debunked across the board as an absolute lie. The New York Times recently dismissed the myth of a Trump-Putin connection, reporting that the FBI has failed to find any links between the two despite a thorough investigation. The Washington Post also dismissed Eichenwald’s conspiracy theory, openly calling him out. And the Intercept’s Glenn Greenwald wrote a piece tearing apart Eichenwald’s false report. None of these facts have stopped Newsweek’s bizarre crusade to spread this misinformation to smear both Trump and Russia, however. And Newsweek is not alone in its campaign: MSNBC’s Rachel Maddow on Thursday night previewed Eichenwald’s story as an important piece of evidence against Trump, and the next morning Eichenwald himself appeared on CNN to present his latest conspiracy theory. Naturally, none of the Clinton-campaigning correspondents challenged his statements. To sum up, Eichenwald published an entirely fabricated conspiracy theory, which has been widely debunked. He attempted to bribe a journalist for his silence. He is now continuing his crusade, with new revelations about an army of geriatric ne’er-do-wells, all the while becoming more and more of a laughing stock. Bravo, Newsweek. Now we know why you went out of print.